Published: March 21, 2018 at 10:50 p.m. Updated: March 22, 2018 at 12:36 p.m. The NFL's free agency frenzy has created quite a buzz and also a lot of new homes for players. Some of them look to fit into their new teams better than others. Check out some of the best free agency fits from around the league. Despite quarterback Case Keenum having a breakout campaign last season for the Vikings, the Minnesota offense had a tough time stretching the ball downfield, as Keenum posted a 64.1 passer rating on deep passes. 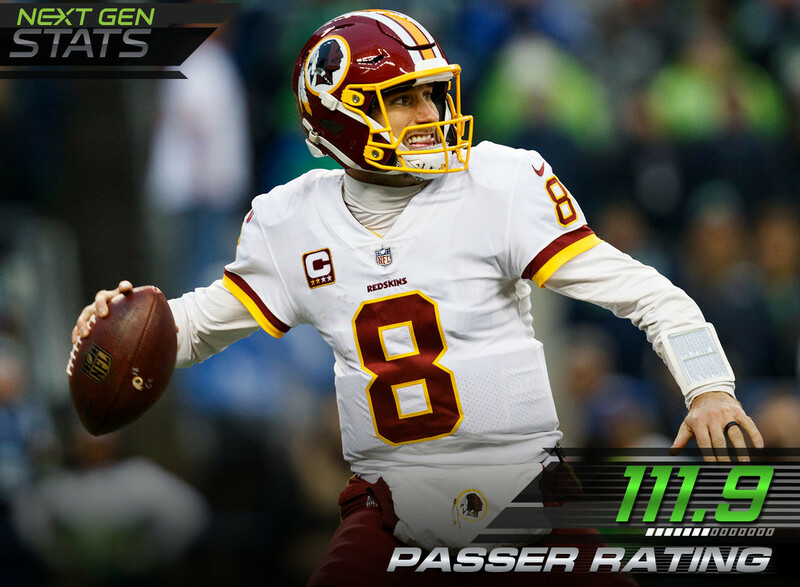 Quarterback Kirk Cousins has excelled at throwing deep the past two seasons, owning the 3rd-best passer rating (111.9) and most touchdowns (19) on deep passes in that span. Cousins' success throwing deep would be the perfect fit for Vikings wide receivers Adam Thielen and Stefon Diggs, as they hold the third and fourth-highest average separation when targeted 10+ Air Yards downfield. The Broncos couldn't find an answer to their quarterback situation this season: between starting quarterback Trevor Siemian , Paxton Lynch and Brock Osweiler, the Broncos struggled mightily when throwing intermediate passes (10-19 Air Yards). Minnesota's Case Keenum was exceptional on intermediate passes in 2017, completing 59.6% of his passes for 1178 yards and a 116.7 passer rating. After cutting running back DeMarco Murray this offseason, the Titans were in the market for a running back who could produce in the passing game. The Titans replaced Murray with the most productive running back in the league when targeted out of the backfield in Dion Lewis. Lewis had a 93.3% catch rate from the backfield and a 126.5 passer rating, scoring three touchdowns with no interceptions. Lewis' arrival in Tennessee puts together one of the best running back tandems in the league, as both Lewis and Derrick Henry ranked in the top 5 in yards gained after defender close in last season at 4.4 and 4.1, respectively. The Chiefs wide receivers unit struggled finding a number two option on the outside to pair with dynamic wide receiver Tyreek Hill, as no other receiver recorded more than 25 targets when lined out wide. With the addition of wide receiver Sammy Watkins, the Chiefs now possess potentially one of the league's best wide receiver duos, as both Hill and Watkins ranked one and two in production from wide alignment with a rating of 125.4 and 122.2, respectively. Watkins also had a 7-1 touchdown-to-interception ratio when lined out wide. After trading for QB Alex Smith, the Redskins needed a deep ball threat for the best deep pass quarterback in the NFL. They found one of the league's best wide receivers in Paul Richardson, as Richardson had a rating of 126.2 on deep passes with 275 yards and three touchdowns. Redskins wide receivers Josh Doctson and Richardson could pose trouble for opposing secondaries who decide to play off coverage against them, as both Doctson and Richardson were some of the most productive wide receivers in the league against off coverage with Richardson recording 455 yards for five touchdowns. The Packers added one of the best weapons in the league to their offense this offseason in the signing of tight end Jimmy Graham. Graham led all tight ends in production when lined out wide with 25 receptions for 206 yards and seven touchdowns, while Green Bay tight ends combined for just 2 receptions out wide. Graham also presents Packers quarterback Aaron Rodgers with a dependable option on tight window throws, as Graham led the league in tight window touchdowns last season with seven. Over the past two seasons, Cardinals quarterbacks (Carson Palmer, Blaine Gabbert and Drew Stanton) all sat below the league average when facing the blitz, while Arizona's newest addition, Sam Bradford, has been the best in the league against the blitz since 2016. Bradford has a 108.7 passer rating against the blitz and completed 71.8% of passes for 1493 yards. Bradford's arrival in Arizona also brings the ability to stretch the field, as his success throwing the deep ball has been significantly better than any Cardinals quarterback over the past two seasons. His passer rating on the deep pass is 110.7, while the closest Cardinals quarterback comes in with a 56.7 passer rating (Carson Palmer) over the past two seasons. After posting the second-lowest catch rate and fewest receptions on deep passes in 2017, the Bears offense was in desperate need of a deep ball threat at the wide receiver position and they addressed that need by signing Allen Robinson. Robinson is one of the most dynamic deep ball threats in the league when healthy, as he ranked in the top 10 in yards (755) , receptions (23) and targets (80) on deep passes from 2015-2016. After a shaky season in the secondary for the 49ers defense, San Francisco went out and signed All-Pro cornerback Richard Sherman. Sherman was much more effective than any 49ers cornerback when being the nearest defender at pass arrival, as he ranked in the top 6 in passer rating (54.8) and catch rate (37.7%) allowed. With the addition of free safety Tyrann Mathieu, look for the Texans secondary to generate more pressure when blitzing this season, as Mathieu posted 12 pressures alone compared to just 10 combined from all of Houston safeties.